In "The Pandorica Opens", Haemo-Goths are the only creatures gathered over Stonehenge, mentioned by River Song, which had not been seen in any previous written or television adventure in the Doctor Who universe. However, they were mentioned in the novel The Forgotten Army. Haemovores appeared in the Seventh Doctor story The Curse of Fenric by Ian Briggs. Vampiric creatures that fed on blood, they were the end result of human evolution in a possible far future, caused by millennia of pollution. As part of his final game against the Doctor, the entity known as Fenric transported the most powerful Haemovore, called the "Ancient One", through time to Viking Age Northumbria. There it waited, trapped beneath the North Sea for centuries, occasionally drawing victims into the water and transforming them into Haemovores. Soon after the transformation, victims appeared much as they did in life, except for elongated fingernails and a corpse-like pallor. Later they became deformed blue-grey humanoids covered in octopus-like suckers. The Ancient One was the least human in appearance; in its own time, it was the last living thing on Earth. During World War II, Fenric released the Ancient One. Fenric's plan was that the Ancient One was to release the toxin which would pollute the world and thus create its own future. The Haemovores had the ability to hypnotically paralyse their victims so they could feed and drain them of blood. Not all of their victims were turned into Haemovores, although the selection process was never explained. The Haemovores were impervious to most forms of attack, surviving being shot at close range by a submachine gun at one point. They could be destroyed in the traditional vampire-killing fashion of driving a stake through their chests. They could also be repelled by their victim's faith, which formed a psychic barrier, like the Doctor's faith in his companions, Ace's faith in the Doctor, Captain Sorin's faith in the Communist Revolution, and even the Reverend Wainwright's failing faith in God; this repelling force can be called into will, the Doctor merely called the names of past companions as a medium. Ultimately, the Seventh Doctor convinced the Ancient One to turn against Fenric, and it released the toxin within a sealed chamber, destroying itself and Fenric's host. Whether this means that the future the Ancient One came from was averted is not clear, although the Doctor seemed to think so. Fenric and his Haemovores return in the 2012 Big Finish Productions audio story, Gods and Monsters. In "The Girl Who Waited", the TARDIS lands on the planet Apalapucia while it is under quarantine due to the outbreak of Chen7, a virus that can kill anyone with two hearts within a day, specifically Apalapucians and the Doctor. The Handbots are programmed to help the citizens of Apalapucia with "kindnesses". Should the patient refuse to be vaccinated, the Handbots open their blank faces to shoot a dart with the medicine. If the patient dodges the needle, other Handbots are then teleported to help inject the patient, and perhaps stun the person by touching them with their human-like hands. The vaccine will kill anyone with one heart. Amy Pond, trapped in the quarantined area, is chased by Handbots trying to give her a "kindness". She discovered that touching their hands together shocked that particular robot, "killing" it. The Hath are aliens that appear as tall, roughly humanoid creatures with fish-like heads, who can breathe in air via the employment of apparatus fitted to their faces that incorporates a canister of green liquid. They are intelligent, emotional creatures – one formed a friendship with Martha Jones, and saved her life at the cost of its own. They seem sentient and while they do not speak a language intelligible to humans, the two races planned to colonize the planet Messaline together. However, they later turned on each other – before their eventual reconciliation, thanks to the Doctor's intervention. The Monster Files feature states that the Hath joined and assisted early human space colonisation. The Hath returned for an appearance in the second part of The End of Time, where they are seen in an alien bar, and they are seen briefly in "The Eleventh Hour" in a clip illustrating the Doctor's role as protector of the Earth, suggesting that they have visited the planet at some point prior to 2010. They also appeared in an alien bar for the first episode of season 9. The Headless Monks are a religious order that can be converted from any humanoid species by the removal of the head. They wear hooded cloaks, giving the impression that they still have a head, however under the hood, the skin is tied into a tight knot where the head has been removed. Despite their name, most people are unaware of this literal description being true, because except under very special circumstances, one incurs a death penalty if they ever remove the hood of a monk. The monks have no detectable life signs, and are endowed with the ability to throw lightning from their hands. They were first mentioned in "The Time of Angels", but did not appear until "A Good Man Goes To War". Hetocumtek is a warrior god, extraterrestrial, who tried to enslave the people of the Mojave plains shortly after he fell out of the skies. However, Native American medicine men were able to trick the vicious god, imprisoning him in a totem pole. The alien, though proved isolated, is still to be powerful. Its ability to make the weather rain large fish attracts Sarah Jane Smith and her gang to investigate the mysterious raining and the totem pole it is trapped in. When Clyde Langer receives a splinter from the pole, he accidentally activates it, thus starts Hetocumtek's escape plan. The alien was able to place a curse on Clyde's name, making him isolated from his friends who suddenly hated him after they spoke of his name. The warrior god began to grow stronger as Clyde becomes more alone. The curse can be broken though, proven by Sarah Jane and Rani Chandra's repetition of name-speaking and Clyde's declaration of "My name is Clyde Langer!" as he touches the totem pole, disintegrating it. A parasitic alien which resides in a human host. Hitchhikers are harmless and may release endorphins into the blood, creating a sensation of euphoria in their hosts. Jack and Ianto captured one at the start of "Children of Earth". A Hoix features in the episode "Exit Wounds"; the first time its name has been mentioned on screen, having previously been seen in the Doctor Who episode "Love & Monsters" two years before. Owen distracts it by feeding it cigarettes stating that it "lives to eat". They are not quite intelligent, being easily tricked by Owen into being vulnerable for a knock-out blow to the head; it has been seen animalisticly chasing Rose and the Tenth Doctor in its first appearance. One appeared as a member of the Alliance to seal the Eleventh Doctor in the Pandorica in The Pandorica Opens. A Hoix was also mentioned in the novel The Twilight Streets. Brothers from the exalted clifftops of Rex Vox Jax who invented and are copyright holders of Hyposlip Travel Systems. They were guests aboard Platform One to see the Earthdeath spectacle. Carnivorous creatures that crawl on the ground of Leela's World. The so-called "Invincible Vampire" is listed by Owen Harper on the Torchwood website as being among the people and creatures cryopreserved at Torchwood Three. The specimen reconstitutes itself when dusted; freezing is the only way to stop it. The Isolus is an alien species, a tiny spore-like creature which travels through space. In Fear Her, one of them was separated from the swarm and the creature wound up on Earth, inhabiting a young English girl named Chloe Webber. The Isolus was confused by Chloe's fears of her father and, acting through her, trapped neighbourhood children in Chloe's pencil drawings. The Isolus released Chloe when the Doctor showed it the love the human race could produce in the events just before the 2012 Summer Olympics. An Isolus is a creature of intense emotion and its sheer need to be together that keeps them alive. In their featuring episode, the Doctor states that, on average, they have a family the size of around 4 billion. The Jagaroth are an ancient and extinct race of aliens introduced in the Fourth Doctor serial City of Death. The Doctor remarked that the Jagaroth were “a vicious, callous, warlike race whom the universe won't miss.” The story reveals that life on Earth moved from being amino acids in a primordial soup to functioning cells because a Jagaroth space ship exploded on Earth 400 million years ago. The sole surviving Jagaroth, Scaroth, manipulated human civilisation to advance the species technologically, in an effort to eventually create a time machine which he could use to prevent the initial explosion. The Jagrafess was a large, slimy, creature that attached itself to the ceiling of floor 500 on Satellite Five. It wanted to control the Earth through the use of a news station. The Jagrafess could not survive in extreme heat and was killed after one of the reporters purposely channelled the heat towards floor 500. It had a human servant called the Editor, who called it Max after its full title: the Mighty Jagrafess of the Holy Hadrojassic Maxarodenfoe. Jixen are a race of turtle-like warriors which first appeared in the K9 episode "Regeneration". They are in a war against the Merons which has gone for centuries across the galaxy. They are able to use sonar type movement that makes them look like they're shuddering and can emit a sonic wave when they use their high pitched battle cry which renders their enemies defenceless. The Judoon are galactic alien police resembling rhinoceroses that work for the Shadow Proclamation. They appeared in the series 3 Sarah Jane Adventures story, Prisoner of the Judoon, in pursuit of a Veil life form known as Androvax that escaped from a crashed Judoon prison transport. They have relatively low intelligence levels but possess sophisticated technology such as H2O Scoops that are capable of lifting large buildings and Thermal Guns that are able to disintegrate targets. The Judoon first appeared as a major alien in the Doctor Who episode "Smith and Jones" as well as the episodes "The Pandorica Opens". A species of humanoids from the planet Skaro who evolved into the fearsome and warlike Daleks. The Kahler are a technologically advanced humanoid race from a planet of the same name. They appear to be the same as humans, other than a green mark on the left side of their face. This green mark is unique to each individual and can be used for identification. Their names are all preceded by "Kahler-". At least some Kahler believe in gods, and believe that when they die they will be forced to climb a mountain carrying the souls of everyone that they have wronged. In Kahler-Jex's case, he believed that all those killed by the cyborgs he helped create, as well as the cyborgs and his own friend Issac would be in his arms. Kastrians are rock-based humanoids that once lived on the planet Kastria millienia ago. Eldrad, one of their brilliant minds, went mad with power; however, they exiled him to Earth. Eldrad's actions left irriversable consequences for the planet, leaving it unable to maintain life on the surface; the species choose genocide over being ruled by Eldrad should he return. When the Fourth Doctor and Sarah Jane Smith successfully tripped Eldrad into a pit, the Kastrian race was completely wiped out. The Keller Machine contained an unnamed psychic parasite that fed on negative impulses. It was brought to Earth by the Master. Kinda (pronounced "Kin-duh") are a species of human-like people. At first glance, one would assume they are similar to the caveman age humans. However, their necklaces seem similar to a double helix, implying they are smarter than they appear. They have legends of the Mara, and are warned not to dream alone to keep it away. The men of the Kinda are not allowed to speak, but if one does, a phophecy says all Kinda will. They have women similar to shamans, they speak almost fluently; when the elder dies, her spirit and knowledge enter her apprentice. A child in the Kinda tribe could have up to seven fathers, though this hasn't been elaborated on; although it could be one biological father and six stepfathers. Appearing as normal cats, Kitlings are used by Cheetah People to scout ahead for prey. The Korven were green-skinned humanoids with large, wing-like ears, two horns on their heads and four horns on their chin. They were adapted to cold temperatures. The colour of their eyes seemed to change continually. They were usually dark grey, but could change to light grey or red. Each eye could be a different colour. Their first appearance was in The Korven. The Kraals reappear in a Big Finish story called The Oseidon Adventure'. Which was released in June 2012 as part of the Fourth Doctor Adventures. The Krafayis are usually invisible griffin-like space-travelling predators that usually fly in packs, but leave behind the weak and injured on nearby planets, where they wreak havoc for the residents of the planet. One such castaway appeared in "Vincent and the Doctor." It could only be seen directly by Vincent van Gogh, or in reflections by others . The Doctor remembers the Krafayis from a Gallifreyan book when Vincent draws a picture of the beast. Creatures composed of crystallized coal. The Krillitanes are an alien race that first appeared in the episode "School Reunion". They had infiltrated the Deffry Vale comprehensive school on present day Earth, increasing the intelligence of the pupils with Krillitane oil. Using the children as part of a giant computer program, they hoped to crack the secrets of the Skasis Paradigm, the Universal Theory that would give them control over the basic forces of the universe and turn them into gods. Their scheme was foiled by the Tenth Doctor and his companions, though not before they attempted to ask the Doctor to join them in remaking the universe. The Krillitanes are a composite race who pick and choose physical traits they find useful from the species they conquer, incorporating them into their own bodies. When the Doctor last encountered them they looked like humans with very long necks, but by the time of "School Reunion", they possessed a bat-like form which they obtained from the conquest of Bessan ten generations prior. However, they were able to maintain a morphic illusion of human form, which could be discarded if needed. A side effect of their rapid evolution made the very oil they were using to enhance the intelligence of Deffry Vale's children toxic to their own systems, reacting with them like an acid. As bat creatures, they sleep in a way similar to Earth bats, hanging from a ceiling with wings covering their bodies. Like Earth bats, they are sensitive to loud or high frequency noises, as demonstrated when they were temporarily disabled by the school's fire alarm. They are also carnivorous and have no qualms in devouring other sentient life-forms for food. A giant squid that has been mutated and enlarged due to ingesting one of the pieces of the Key To Time. The green-skinned citizens of the planet worship Kroll as a god. Even the Doctor poked fun at their blind worship, pointing out Kroll couldn't tell the difference between them and lunch. The Krynoids appeared in the Fourth Doctor story The Seeds of Doom by Robert Banks Stewart. They are a highly dangerous, sentient form of plant life which are renowned amongst galactic botanists. They spread via seed pods which travel in pairs and are violently hurled through space by frequent volcanic eruptions on their unnamed home planet. The pods when opened are attracted to flesh and are able to infect and mingle their DNA with that of the host, taking over their body and slowly transforming them into a Krynoid. The species can also exert a form of telepathic control over other plant life in the surrounding area, making it suddenly dangerous and deadly to animal-kind. In the later stages of development the Krynoid can also control the vocal cords of its victims and can make itself telepathically sympathetic to humans. Fully grown Krynoids are many meters high and can then release hordes of seed pairs for further colonisation. Two pods arrived on Earth at the South Pole during the prehistoric Pleistocene era and remained dormant in Antarctica until discovered at the end of the twentieth century. One of them hatched after being exposed to ultra-violet light, and took control of a nearby human scientist. The Fourth Doctor intervened in the nick of time and ensured the Krynoid was destroyed by a bomb, but the second pod was stolen and taken to the home of millionaire botanist Harrison Chase in England. Chase ensured the germination of the second pod, which overtook his scientific adviser Arnold Keeler, and transformed its subject over time into a virtually full-sized Krynoid. Unable to destroy the creature by other means, and with the danger of a seed release imminent from the massive plant, the Doctor orchestrated an RAF bombing raid to destroy the creature before it could germinate. The Krynoid are also featured in the Eighth Doctor audio story for Big Finish entitled Hothouse. Also featured in BBV audios 'The Root of all Evil', and 'The Green Man'. Cassandra O'Brien.∆17 was a surgically-altered human from the year 5,000,000,000. She considered herself to be the last true human despite being no more than a brain and a piece of skin. The Logopolitans of the planet Logopolis were featured in the episode of the same name. The Logopolitans were a race of strange-looking mathematicians concerned with entropy to make sure heat death of the universe did not occur. This was disturbed by the Master and the Logopolitons were killed, although the universe was saved. The Macra first appear in the 1967 Second Doctor story The Macra Terror by Ian Stuart Black. They are an intelligent, giant crab-like species from an unnamed planet colonised by humanity in the future. The Macra invade the control centre of the colony and seize the levers of power without the colonists – including their Pilot – knowing what had happened. Thereafter the Macra only appear at night, when the humans are in their quarters, observing a curfew. They have strong hypnotic powers which alter human perception. They also have the ability to ensure messages are vocalised through electronic apparatus such as television or sensor speakers. Both these tools are used to keep the human colonists under control, believing they are blissfully happy. This provides a cover for the Macra to use the colonists as miners in a vast gas mine. The gas is deadly to the miners but vital to the Macra, enabling them to move more quickly and rejuvenating their abilities. The Second Doctor effects a revolution on the Macra planet and helps engineer an explosion in the control centre, destroying the Macra in charge. The Macra are also featured in the 2007 episode "Gridlock", becoming the first one-off opponent of the Doctor in the classic series to appear in the revived series so far, with the Zygons reappearing in the Eleventh Doctor story, The Day of the Doctor. In the episode, some Macra are found to be alive below New New York, a city of New Earth. They live in the thick fog of exhaust gases on the main motorway under the city, tracking the flying cars by their lights and snatching at them when they get too close. The Doctor says that the species is billions of years old and once developed a small empire as "the scourge of this galaxy", but the Macra beneath New New York must have devolved into nothing more than beasts. The Malmooth are a race of humanoid insectoids native to the planet Malcassairo, who are all but extinct by the year one hundred trillion. The last surviving member of their race, Chantho, played by Chipo Chung, appears in "Utopia". A devoted assistant to Professor Yana for seventeen years, when the Professor is revealed to be the Master and proceeds to turn on the Doctor and his companions, Chantho threatens to kill him. He electrocutes her, but she manages to shoot him before dying, forcing him to regenerate. A feature of Chantho's speech is that she starts with "chan" and ends her sentences with "tho". She considers it "rude" to do otherwise, tantamount to swearing, although she is able to speak normally and does so by saying "no" to Martha. Physical features of the Malmooth include an insectoid exoskeleton and mandibles, and the ability to survive by drinking their own internal milk. The Eighth Doctor encountered another of the Malmooth during a flashback sequence in IDW's 'Doctor Who: The Forgotten' issue 5. A being of pure evil, created as a sentient war machine. A sentient megolomaniac energy, the Helix sneaked on board the TARDIS when the Doctor accidentally piloted it too close to a black hole. After in arrived in ancient Italy, the Helix decided to use the Brotherhood of Demnos as its agents; it infused them with its power, turning them into beings of pure energy. However, the Doctor was able to stop it by tricking the Brotherhood into a trap that drained all the Helix energy out of them and back into space. Inhabitants of the planet Manus, they have legends of the Mara and hold an annual festival to celebrate their vanquishing of the monster. However, the remnants of the Mara in Tegan's mind tricked her into taking it back to Manus, where it attempted to feed on the negative emotions of the Manussans. Local life on the planet Alzuria. They killed the original humans that crash landed on the planet, gradually evolving into humanoid form to take their place; however, the many years that this took caused the truth to be lost. In the Doctor Who universe, the planet Mars is home to two known forms of sentient life: the Ice Warriors, a race of reptilian humanoids, and the Flood, a sentient, water-borne virus encountered by the first human base on Mars in the episode The Waters of Mars. The Tenth Doctor was accidentally identified as a Martian by Donna Noble during their meeting with the Empress of the Racnoss. The Mayfly is an insectoid creature seen in the Torchwood episode "Reset". It is used by medical research facility The Pharm, run by Professor Aaron Copley as part of a drug that is capable of resetting a human body suffering from normally fatal diseases to a healthy state. However, it eventually kills the host as it reproduces inside the body; at worst, the mayfly kill each other until only one is left. This grows inside the chest until it bursts out, but all human subjects to date have died before they reach that stage. During Torchwood's investigation of The Pharm, Martha Jones is briefly infested with a mayfly, and is the only person to survive because her travels in the TARDIS have apparently improved her immune system. Owen uses the singularity scalpel to remove the mayfly from her body before it can do so itself. After Ianto and Gwen discover the parent mayflies behind the Pharm, Jack has the entire facility destroyed so that the mayflies can no longer be used, and they are allowed to die in peace. Large, spherical robots created by humans to prepare the planet Mechanus for colonisation. They kept stranded astronaut Steven Taylor prisoner as he did not have their control codes. Daleks, pursuing the TARDIS crew, engaged the Mechonoids in battle. Which side was victorious is not shown. Spelt 'Mechanoid' in various subsequent comic strip appearances. Medusoids are hairy jellyfish with claws, teeth, and a leg. They are mentioned only in passing by the Doctor in the episode Frontier in Space, who was once captured by them and interrogated via mind probe. The Menoptra (spelled Menoptera in the novelisation of the serial) appeared in the First Doctor story The Web Planet, by Bill Strutton (1965). They are an intelligent, bipedal insectoid species from the planet Vortis. In appearance, they resemble a cross between giant butterflies and bees, with each Menoptra possessing four large wings. They have yellow and black stripes around their bodies and appear to be around six feet tall, but do not seem to have typical insect body parts (such as mandibles or an abdomen). Peaceful and kindly by nature, the Menoptra move in a unique, stylised way and their vocal inflections are stilted. They were very welcoming of the First Doctor, Ian, Barbara, and Vicki; but showed an animosity towards their fellow insectoids, the Zarbi, as well as an abhorrence for the Animus, a hostile alien intelligence that had taken over the originally passive Zarbi and almost all of Vortis. Once it was clear that the Doctor was willing to help them defeat the Animus, they were only too glad to assist in any way they could. The assumption is that once the Animus was defeated, the Menoptra, Zarbi and the rest of the inhabitants of Vortis were able to live together in peace. Menoptra born without wings are considered second-class citizens. A Menoptra and a Zarbi were shown on cover of the first edition of Doctor Who Annual in September 1965 along with two other Doctor Who alien races, a Voord and a Sensorite. The Mentors are an amphibious race native to the planet Thoros Beta. They have two arms with a large tail in place of their lower limbs, and speak to other species through a translation device worn around their necks. The most notable of the Mentors is Sil, whom the Sixth Doctor and Peri encountered first on the planet Varos in Vengeance on Varos, and then again on Thoros Beta in Mindwarp. Both stories were written by Philip Martin. Other Mentors include Lord Kiv, their leader. Typical Mentor business practice includes arms dealing and slave trading. In Mindwarp, Lord Kiv has his brain transplanted into a primitive Mentor body, which has retained the tail sting that modern Mentors no longer have. The Metalkind originated in a planet in the Tornado Nebula. They are currently at war with the Fleshkind. A metal man from the species crashed down to Earth where he seeks for a child, Sky Smith, before she is primed as a weapon of the Fleshkind. Miss Myers, Fleshkind, reprogrammes him so he would swear veangance on all flesh kind, including Earth inhabitants. He calls out to the Metalkind as a portal is opened by Miss Myers, luring Sky to her "destiny". Clyde Langer and Rani Chandra is able to stop the nuclear reactor, causing the portal to backlash at Sky, destroying her previous biology as a bomb. The metal man saved enough energy from the portal, forcibly grabbing on to Miss Myers as he creates another portal, pulling them back into conflict at their home planets. An unnamed and unseen creature found on the surface of the planet Midnight, an environment supposedly inimical to all life. Described briefly as a "shadow" glimpsed running across the landscape, it was encountered in Shuttle Bus 50 in "Midnight". It violently boarded and took over the body and mind of Sky Silvestry, repeating the speech patterns of the passengers, influencing them, and then appropriating the Doctor's voice. The shuttle's hostess ultimately sacrificed herself by opening a door and sucking them both out of the bus, where Silvestry's body was presumably vaporised by the deadly Xtonic sunlight. Though its hold on the Doctor and the other passengers was broken, the nature and fate of the creature itself remains uncertain. Disturbingly, even the Doctor had no idea what the creature was. A diminutive race of aliens mentioned on the Torchwood website. Around 5 cm high, they travel on radio waves and can reconstruct themselves using energy from the receiver. They are often found in radios. A being that feeds on peoples beliefs, and distant cousin to the Nimon. Its people descend upon planets to pretend to be gods, so they can be worshipped; however, this one picked the wrong planet and ended up being sealed inside a prison floating through space that kidnapped victims for it to feast on. When the Doctor meets it, it is completely taken over by its instincts. It does not want to feed on people but it has no choice. It is imprisoned on a spaceship which generates an illusory hotel with someone's fear in each room. The Doctor gives this being space to die when he cuts off the food supply by stopping Amy from trusting him. When the Minotaur feeds, it makes the person worship it and want to be killed by it. The Mona Lisa is an alien organism that exists in a mineral that was used in paint supplied by Giuseppe Di Cattivo in the 15th century. Leonardo da Vinci used the paint for his famous Mona Lisa, and when the picture is brought into proximity with Giuseppe's notorious painting of The Abomination - a painting considered too terrifying to be seen - both the pictures come to life in Mona Lisa's Revenge. In order to release The Abomination, she forced Clyde to draw a key that she could use to turn the key to reality. The Mona Lisa was successful in doing so, but accidentally transforms a previous drawing of K-9 to life as well, who locks The Abomination and return all moving paintings to its original positions. A one-eyed, mop-haired race that co-inhabited the Ark, a vast ship bound for a new home planet after Earth seemingly disintegrated. A Morphant, (also called a Deathworm Morphant), is an amorphous snake-like creature from the planet Skaro. The Movellans, who made their first appearance in the Fourth Doctor serial Destiny of the Daleks, are an android species originating from outside the galaxy. They were adversaries of the Daleks. Movellans outwardly resemble physically attractive humans of various ethnicities and both genders. All Movellan androids wear white, form-fitting uniforms and have silver hair braided in a dreadlock style. They are stronger and have more physical endurance than human beings. Their culture believes that it is dishonourable for an alien to view their death. A major weakness of the Movellan design is an external power pack which each android carries on its belt. This can be removed with comparative ease, causing the android to completely shut down. Once removed the power pack circuitry can be reprogrammed so that the android will obey the orders of another being. The Movellans are mentioned again in Resurrection of the Daleks, where as a virus of their invention was central to that story's plot. A multiform is a type of shapeshifting alien resembling a viperfish. The only known example is Prisoner Zero. They are capable of using perception filters. In their default form, they hang from the ceiling, but can take other shapes by forming a psychic link with people who are inactive (such as coma patients) and using images from their subject's dreams. Mummies (servicer robots wrapped in a protective cloth bandage) appeared in the Fourth Doctor's adventure, Pyramids of Mars. They were bringing back their leader Sutekh from a prison on Mars. The Nestene are a blob-like aliens who can control all forms of plastic, creating Autons. Since the Last Great Time War destroyed their food supply planets, the Nestene have been seeking replacements. The Night Travellers feature in the episode "From Out of the Rain", portrayed as a travelling circus group in the late nineteenth century and early twentieth century. They were described as only appearing at night, and "out of the rain". This suggests that some kind of H2O Scoop technology may have been used, but since the Night Travellers were humans, this is unlikely. The Night Travellers stole the breaths of their audiences in order to keep a permanent audience, the people themselves vanishing along with the Night Travellers. However, with the rise of cinema in the 20th Century, travelling circuses diminished, including the Night Travellers. Jack Harkness called them an extinct species. However, the Night Travellers survived on old film reels. The certain Night Travellers in particular were of the Joshua Joy Travelling Show, led by the creepy ringmaster called the Ghostmaker, who carried a silver flask with him to store the captured breath of his victims. He was infatuated with Pearl, whom he describes as a living mermaid due to her deep love and connection with water. The two escape from a film reel played in the Electro Cinema in Cardiff, and begin collecting breaths again to rebuild their lost audience. However, this time, the victims are left alive but severely dehydrated. The Ghostmaker and Pearl decide to bring the other travellers back into the world and continue travelling again. Stealing the film from the workshop of Jonathon Penn, the two go to the Electro Cinema and play the footage, bringing their other companions out - a weightlifter, a pair of clowns, a tattooed man and a pair of jugglers who doubled as firebreathers. However, unbeknownst to the Night Travellers, Jack and Ianto Jones record all of them onto a new film strip. Ianto stole the Ghostmaker's silver flask and lures him out into the sunlight. Jack exposes the new film strip to sunlight. Exposed to the light, the Night Travellers are all erased from existence. Seconds before his demise, the Ghostmaker opens the silver flask and casts the captured breaths to the air, destroying all but one breath. Despite their defeat, Jack claimed they could return if more footage of them was recorded. This is also hinted in a final scene of the episode in which a father and son buy an old film reel at a car boot sale. The boy drops the reel which opens, a familiar melody of circus music echoing out, which is heard by Jack. The Ghostmaker was portrayed by Julian Bleach who would go on to play Davros in the finale of Season 4 of Doctor Who. The Nightmare Man is rather not an alien, but rather a trans-dimensional being who had found a way into Luke's mind in The Nightmare Man. He then fed off of Luke's fear and became real, trapping Luke in the dimension human minds travel to when they dream. The Nightmare Man begins to integrate within other people's mind, including Clyde and Rani, trapping them as well in separate dreams. However, as fear can only be caused by loneliness in his terms, Luke was able to get Clyde and Rani to imagine a door that led to Luke. There, they tricked The Nightmare Man (after getting his attention for they were together) into trapping himself inside the dimension forever. May be related to the emotion-feeding Pied Piper. Minotaur-like beings that go to other planets, posing as gods. However, they are nothing more than a paracitic race that bleed planets dry before moving on to new ones in a repeating cycle. They are cousins to the Minotaur species the Doctor encountered in "The God Complex" While one posed as a god, it acquired sacrifices to be used as batteries for powering their teleporter. However, the Doctor's arrival prevented more than two extra Nimon from arriving; the rest tried a last-resort plan by blowing up their now resource-deprived planet, killing them all. The Nostrovites feature in the episode "Something Borrowed". Jack describes them as 'carnivorous alien shape-shifters with a taste for human flesh'. Nostrovites hunt in pairs and mate for life. They are most notable for their method of reproduction; after fertilisation, the female passes her eggs to the male, who stores them in a protective pouch in the throat, where they can be passed into a suitable host through a bite. The eggs are incubated within the host until they are ready to hatch; the female then tracks down the host and tears them open to free the offspring. (Jack even joked that "Darwin would have had a field day if he made it to space.") Female Nostrovites are also resilient to injury; one survives being shot with two full clips of bullets, while her mate is killed by only a few shots from Gwen the previous night (Although Owen speculated that "some mother instinct or something is making this cow unstoppable.") They only appear to attack living prey: the female does not attack Owen when she realises he is dead. The female adapts to pose as a woman in a black dress, Rhys's mother Brenda and Jack, after only brief encounters with the latter two, suggesting at some slight psychic power (The female also attempted to use Gwen's attraction to Jack to put her off-guard by posing as him). However, they are unable to imitate smells; Gwen recognises Rhys' real mother by her (disgusting) perfume. When they are revealed as Nostrovites, their eyes turn red and their teeth become elongated and grey. Creatures that resemble rocks, which brought to earth by an escaped convict. Their primary diet is protein; this was regularly provided in the years of human sacrifice. However, at the time of the Doctor's arrvial, the Ogri had been attacking stray humans and consuming them for sustenence. Ogrons are mercenaries employed by various parties to "do their dirty work" throughout the universe. They strongly resemble Orcs or Uruk-hai from The Lord of the Rings, being large humanoids with thick gray skin, protruding brow ridges, and thick, tangled hair. They primarily employ stun weapons, and have been employed by both the Daleks and the Master on at least one occasion. They first appeared in the Third Doctor serial Day of the Daleks. The Optera appeared in the First Doctor story The Web Planet by Bill Strutton. These caterpillar-like creatures were once Menoptra, but they elected to instead burrow under the ground and abandon the world of light and flight above. It is implied that they may have been driven there by the malevolent Animus. They have larger eyes than their Menoptra brethren, and have no wings. However, they have numerous arms and appear to "hop" in a stylised way. They speak with inflection different from that of their bee-like cousins, but their speech is a strange dialect of the language of the "upper world" and words and phrases they have coined for themselves. At the story's end, the Animus is defeated and the Optera are persuaded to return to the surface, where they look forward to their children learning the joys of flight; implying that once back on the surface the Optera will redevelop wings. It is assumed that all of species indigenous to Vortis are now living peacefully together. Orderlies are grill-mouthed humanoids that serve the Shakri, and therefore, the Tally. They are known to disguise themselves as surgeons in order to cover their mouths with surgical masks. They captured humans from the hospital Rory Williams worked during the Year of the Slow Invasion; they lacked any real threatening skills, only being able to hold humans down for sleeping injections. They are turned off by the Doctor's sonic screwdirver, and left to be blown up on the Shakri ship. The Osirans were a powerful alien race who were equal to the Time Lords and much of whose history became encoded in Egyptian mythology. Sutekh, a renegade who became evil, was one of them. He was pursued across the galaxy by his brother Horus and was finally defeated on Earth by the combined might of 740 Osirans. Sutekh was trapped in a hidden black pyramid in Egypt, held in place by an energy beam transmitted from a pyramid on Mars. Once the beam was disabled, the Doctor managed to travel back to earth before it released Sutekh and using a control from the TARDIS was able to set the end of the transit tunnel millions of years into the future so when it released Sutekh was dead. Overlords are humans of the 30th-century Earth Empire, as they are called by the Solonians. This name refers only to those who have colonized their planet, not to humans in general. Patchwork People are humanoid beings built by House by combining body parts from various humanoid species; however, the wrong parts can literally result in one having "two left feet." House can take control of them at any time to make his voice heard. The only known examples are "Aunty" and "Uncle", who die when House leaves their universe to enter N-Space. The Corsair was the last known victim to be used as spare parts; Aunty got his forearm while Uncle got the spine and kidneys. Idris and Nephew may have gotten repaired this way as well, but it would have likely been internal parts since they didn't appear misshapen. Pelodonians appear humanoid, but are still in age of a lack of advanced technology; at least when the Third Doctor visits the first time, when Pelodon is being considered admittance into a galactic alliance. In the Doctor's first adventure, Pelodon was ruled by a half human king named after the planet; his second trip saw him meeting King Pelodon's daughter, a 1/4 human queen. The Peg Dolls are simply small dolls that frighten George, a Tenza changeling, who can "put" anything he fears in his cupboard, even people. When people are in the doll house in the cupboard the dolls want to "play", and do so by chasing them and turning them into dolls by touch. They have childlike mentality, being unable to tell their victims are trying to stay away from them. However, when George faces his fears, all the people in the cupboard go back to where they were before, even if they were turned into a doll. These include; Amy Pond, Elsie Rossiter and Jim Purcell. Based on the mythical piper in the fairytale, the Pied Piper was an energy entity from the Jeggorabax Cluster, home to beings that feed on emotions. The species' spacecraft resembled meteorites; one such ship crash landed on Earth in the Weserbergland Mountains, Lower Saxony in 1283. Feeding off the emotion of fear, it assumed the human disguise of The Pied Piper and stole away all the children of the town of Hamelin, creating fear from parents. The First Doctor, John and Gillian first meet the Pied Piper in the comic Challenge of the Piper. This is also the first story to ever feature the Pied Piper in Doctor Who. Over the centuries, the creature continued to abduct children and terrify their parents, using many guises including Odd Bob the Clown, who kidnapped children in wartime New York. In the 2009 story The Day of the Clown, posing as both the ringmaster Elijah Spellman and as Odd Bob, the entity established a museum in Ealing named Spellman's Magical Museum of the Circus, made possible by the presence of the Weserbergland Meteorite at the Pharos Institute. Because of Sarah Jane's affiliation with Pharos, she broke some of the meteorite and used it to trap the alien in it, after having weakened it by laughing at its clown form instead of fearing it. The meteorite was then sealed in a special emotion-proof container made out of Halconite steel in Sarah Jane's attic. In "Daleks in Manhattan" and "Evolution of the Daleks" (2007), the Cult of Skaro experimented on humans and turned them into Pig Slaves if they possessed a low level of intelligence. Just why the Daleks chose such a form for their slaves is unknown. The Pig Slaves captured subjects for the Dalek experiments, taking them through the sewers of Manhattan to the basement of the Empire State Building. Some pigs hid in the Broadway theatre where the showgirl Tallulah performed. Tallulah later sees her "missing" boyfriend, Laszlo, but does not immediately recognise him because he has been mutated into a half-pig/half-man form. Laszlo still retains most of his memory and personality since he managed to escape from the Daleks before the process could be completed. He leaves a single white rose for Tallulah in her dressing room each night before her performance and is able to resist the Daleks, unlike the other mutants. True Pig Slaves are extremely aggressive and savage creatures, and according to Laszlo, capable of slitting a throat with their bare teeth. However, they are also vulnerable and have very short lifespans, only surviving a few weeks. 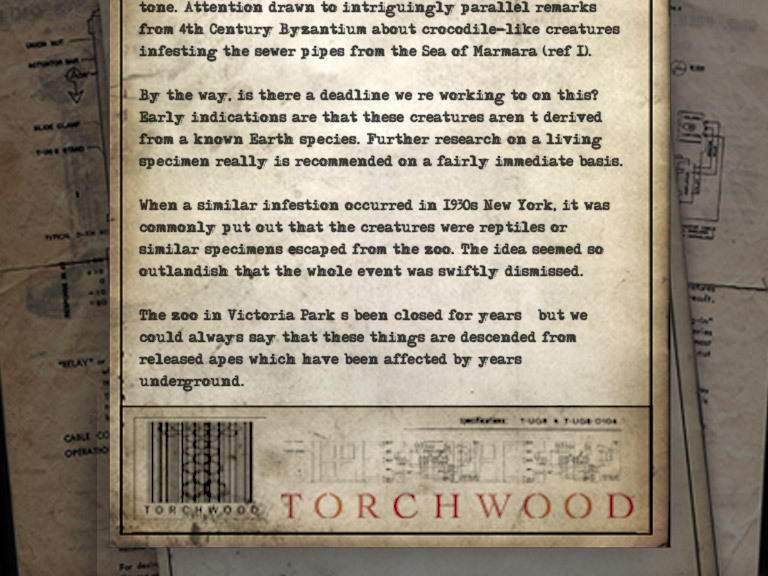 The Torchwood Institute website states that 1930s New York suffered an infestation similar to the Weevil infestation of Cardiff in the late 2000s, and that it was covered up by rumours of sewer crocodiles. This is presumably intended by the website's producers to tie in the New York's Pig Slave infestation of Daleks in Manhattan with the stories of the Torchwood universe. Creatures assembled by the Xeraphin from particles in the atmosphere. Plasmavores are shape-changing aliens that live on haemoglobin. They absorb blood from their victims, which in turn changes their own blood chemistry to that of the victim, allowing them to mimic other species when medically scanned. A Plasmavore was hiding from the Judoon in the Royal Hope Hospital on Earth, disguised as Florence Finnegan. In addition to a number of named races, there were also a few unnamed species aboard Platform One. These included the Ambassadors from the City State of Binding Light, Cal MacNannovich, the reptilian Hop Pyleen brothers, the Scholars of the University of Rago Rago 56 Rago and the robotic Adherents of the Repeated Meme. A race of diminutive reptiles. Primords were humans mutated by slime produced as a by-product of Project Inferno. The creatures were never actually called Primords in the story, although they were credited as such. In some circumstances, the infection could be transmitted if a Primord touched a human and heat would cause the transformation to progress at a more rapid pace. Primords were resistant to pistol fire, although they could be injured by repeated rifle fire and killed by sudden drops in temperature or in falls. The degree of intelligence displayed by the Primords was variable; they acted primarily on instinct, but displayed signs of organisation and tactics, especially in the early stages. They made a high-pitched, screeching sound, which the Doctor claimed that he had heard during the eruption of Krakatoa in 1883, suggesting that he had encountered, or at least heard, the creatures before. Psychic Pollen is a small lifeform that appeared in the episode "Amy's Choice". It is small enough to fit in the hand. They are native to the Candle Meadows of Karass Don Slava. When enhaled, it induces a dream state and takes the darkness in the minds of those affected, giving form and a voice to torment them. However, it will perish quickly if it feeds on minds with little darkness; the Doctor points this out to Amy and Rory. However, for someone like the Doctor, who has hundreds of years worth of darkness in his mind, the voice and form the psychic pollen creates from the darkness is like a completely separate person - the Dream Lord. The Torchwood Three team keeps a pterodactyl as a pet (specifically, a Pteranodon). It is first seen in "Everything Changes", flying inside the Torchwood Hub as well as in the skies over Roald Dahl Plass at the end of the episode. The cast and crew have nicknamed the pterodactyl "Myfanwy". On the Torchwood website, the characters also refer to the pterodactyl by the name Myfanwy. The creature came through the Cardiff spacetime Rift and began eating sheep, only to be captured by Torchwood and subsequently socialized. It is also nocturnal, and is content to "come and go at night", with a few sightings which thus far have not caused any concern, except for a few missing sheep in Barry which have been attributed to "black panthers on the loose", a reference to phantom cat sightings especially common in South West England and South Wales. In "Cyberwoman" it is revealed that the team use a special type of "barbecue sauce" (the website describes it as a special protein sauce) to help it identify what food is safe for it to eat. In flashback scenes in "Fragments" the Pteranodon is seen again when Ianto joins Torchwood by helping Captain Jack capture it, Jack deciding to keep it as a watchdog. Pteranodons appeared in "The Wedding of River Song" in Hide Park in the terminated timeline created due to time dying. They are considered vermin and park-goers are requested not to feed them. Pteranodons appeared on the Silurian ark in "Dinosaurs on a Spaceship", put there in the Silurian's attempt to conserve all the life on Earth. The Pyroviles are a race of aliens which appeared in the episode "The Fires of Pompeii". With a stone skin held together by living magma, their shape resembles Roman Centurions. One of their ships fell to Earth thousands of years ago, shattering them into dust. The earthquake that caused Mount Vesuvius to erupt in the year 79 re-awakened them, and they possessed human hosts in nearby Pompeii. These hosts helped the few adult Pyroviles who had survived to construct an energy conversion matrix to use lava inside Mount Vesuvius to conquer Earth and power the conversion of the whole human race into adult Pyroviles in order to replace their homeworld of Pyrovilia, which was "lost". Throwing water over them is fatal, since it causes their magma to cool. They are also capable of breathing fire; their breath is shown as powerful enough to incinerate a human in seconds. The invading Pyroviles were supposedly destroyed in the AD 79 eruption of Mount Vesuvius. In "The Stolen Earth"/"Journey's End", it is revealed that Pyrovilia was among the 27 planets snatched into the Medusa Cascade by the New Dalek Empire. After their defeat, all the planets were returned to their rightful places. This page was last modified on 30 March 2016, at 22:09.